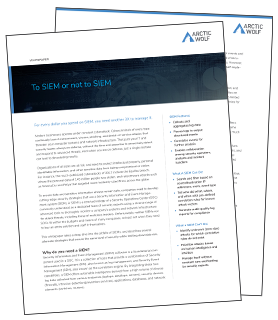 White Paper: Why Choose MDR over MSSP OR SIEM? Popular business applications are increasingly delivered through the cloud using a software-as-a-service (SaaS) model, and cybersecurity applications are no exception. This is good news for small to midsize enterprises (SMEs) that don’t have the budgets for in-house security technologies like a SIEM, and lack security experts on their IT staff to manage them. Above and beyond an in-house SIEM or what MSSPs can offer, security operations center (SOC)-as-a-service is the turnkey solution that gives SMEs MDR capabilities and more, using a scalable, cloud-based SOC with human-augmented machine learning (Hybrid AI) and a predictable pricing model. See why a cloud-based SOC-as-a-service has rapidly become the preferred approach to detect and respond to advanced threats that bypass your existing security controls.